Another excellent site devoted to Celtic coinage and its origins. High-resolution pics and comprehensive details, maps showing Iron age tribes, etc. Free Virtual Tours and e-Cards from Wales. Cwlwm beads are carefully cast in sterling silver amd encrusted with the eternal magic of original Celtic knotwork. In jewellery, they are carefully combined with genuine gembeads on bracelets, earrings and necklaces which are beautifully boxed and labelled. Awen Celtic Spirit - Authentic Celtic Art: Awen Celtic Spirit is a shop in the Romano Celtic town of CAERLEON. We sell all things Celtic, Arts & Crafts and much more! Discover the Myths and legends surrounding Celtic West Wales. Annie Wealleans of Blackdragon lives and works in West Wales. Unique Celtic beads and associated jewellery. Hand-carved wooden jewellery. Celtic and animal totem pendants, brooches and earrings; one-off necklaces using wood of your choice. The Welsh Gold Centre. Designer Celtic Jewellery by Rhiannon -original and beautiful designs, hand-made in silver, gold and Welsh gold. Created by Welsh-speaking craftworkers in the heart of rural Wales. The Celtic artwork of renowned Welsh-born artist Courtney Davis. Books, prints and other products incorporating Courtneys art. Recommended site, incorporating some extremely fine artwork. Curious Celtic Collection - designs based on insular British art and the Sutton Hoo hoard. Crafts Midwales - hand-woven baskets from willow and hedgerow materials using traditional basketmaking techniques, also garden products and fleece rugs. Comprehensive information on the history and ancient sites of West Wales. Created as a useful guide and reference site for http://www.celticcottages.co.uk where traditional holiday accommodation can be found in the heart of Pembrokeshire. The Beginner's Resource Guide to the Bodhr�n - The bodhr�n is an ancient Irish instrument that has gained mainstream popularity over the last 50 years. Celtic Wanderings - amazing Celtic Photography from the Ireland and Britain, Photographs of Ireland, Scotland and England. Take a journey with the Celtic Wanderer as he evokes a romantic vision of a time gone by and a slower pace of life of the Irish, Scottish and English countrysides. One of the ‘greats’ of the Celtic art revival of this century. Known worldwide, there is stunning artwork on this site! Highly recommended. Quality Celtic artwork by Sara McMurray-Day of Celtic Moon Design, Co. Leitrim, Ireland. Ireland's longest-established bodhran-maker, Malachy Kearns. All you ever wanted to know about the bodhran, including the unique book "Wallup!" by Malachy himself. This is THE site for Irish bodhrans. Malachy's instruments are used by Riverdance, The Chieftains, Christy Moore and many others. Instruments are sent worldwide, on-line purchasing facilities. Celtic Impressions�Jewellery handcrafted in the spirit of the Celts by John and Anne Daly. Greyfriars Antiques - Edinburgh. Quality antique Scottish jewellery . Hebridean Jewelry - manufacturers of silver and gold jewellery from the Pictish and Celtic periods through to the new millennium range. Andrews Carvings - original hand crafted wooden sculpture. Specialist holidays in the Highlands of Scotland, focusing on culture, Celtic heritage and environment. Much valuable information on ancient sites and locations. Excellent site devoted to 5000 years of history, monuments and archaeology of this special area of Argyll on Scotland’s west coast. Well recommended. Excellent Scottish site dedicated to Pictish carvings, history and information. Growing rapidly and well recommended, lovely photos of carvings and very informative. Excellent site dedicated to the history and research of the ancient Gaelic illuminated manuscript The Book of Deer. Site dedicated to Celtic history, folklore, ancient wisdom traditions, religious studies and musicology. Based around the work of Karen Ralls-MacLeod, author of the recommended book ‘Music and the Celtic Otherworld’. High quality hand-crafted Celtic leatherwork from Ullapool on Scotland's north west coast. Many beautiful items to choose from, created in an area of breathtaking Highland beauty. On-line purchasing facilities. The Celtic artwork of James Mackenzie-Summers. High-quality work. International Summer Courses, Centre for Continuing Education, University of Edinburgh. Many options to choose from including Gaelic for beginners and advanced. Music In Scotland. The best in traditional music from the Celtic nations. Guided tours of ancient sites in Scotland. History and cultural information, workshops and more. The sites visited are within an hour’s reach of Edinburgh. Almost 8000 years of Scottish history available online. Well recommended and informative site, much valuable information. Site about the book �Memories of a Childhood in Glasgow�, by David Reilly. Fascinating account of the author�s life in The Gorbels. Read how it really was! The Archibald Knox Society - The mission of the society is to promote the legacy of Archibald Knox both nationally and internationally, thus furthering the artistic and cultural identity of the Isle of Man and attributing to Knox his rightful place in the history of the decorative arts as one of the foremost artists/designers of the late 19th and early 20th centuries. Leather goods handmade in Cornwall, Celtic illumination. Cornish Folklore Society - celebrating and promoting Cornish folklore, myth and legend to a 21st century world audience. For something completely different - Celtic designed marble boxes inlaid with Gemstones such as Lapis Lazuli and Malachite. MEYN MAMVRO magazine. Long-established quarterly magazine dedicated to the ancient stones and sacred sites in Cornwall. Produced and edited by Cheryl Straffon, author of "The Earth Goddess - Celtic and Pagan Legacy of the Landscape", and other well-recommended books. Excellent source of Breton books, music, instruments and culture in general. Run by Breton historian and musician Gweltas ar Fur. English translations on all sections. Site dedicated to Breton National costume, with history and also sales. Located in Brittany. Useful information. Fully comprehensive site covering all aspects of the Island of Lindisfarne. 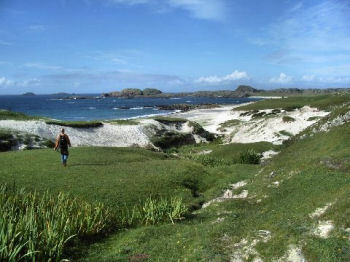 Much recommended site devoted to this Holy Island of pilgrimage. Maker of fine handcrafted musical instruments since 1989. Clarsachs made in the traditional way,from native hardwoods, and with the soundbox hewn from a solid block. LTG (Living the Gospel) organise pilgrimage holidays that journey to the heart of Celtic Christianity in the British Isles through worship, lectures and excursions. Celtic Music - Hilary Rushmer presents CD's and cassettes of traditional and original melodies from the British Isles, played on traditional instruments. Celtic Christianity in East Anglia, England. Members and Friends of the Community share news and events, and items of interest in and around the region. Hand-thrown stoneware pottery by Damian O'Keefe, including large and small pieces decorated with a variety of original Celtic designs. Commissions undertaken. The Celtic artwork and greetings cards of Chris Down. Recommended site for Celtic artists. Celtic design clip art on CD ROM. Not run-of-the-mill tack, there is some really nice work on this CD ROM which comes with comprehensive instructions for varied uses. Illustrations can be seen on the web site. Celtic artwork, quilling, calligraphy and other beautiful and unique work by Lesley Davies. Excellent and varied site. Celtic crosses, Celtic & Pagan plaques, Welsh Dragons, and more. Original designs cast in stone then carefully hand-painted. Celtic artwork site by Belgian artist Jan Derboven. Very intricate, beautiful and unique work, and an excellently designed site. Recommended. Very beautiful site of Byzantine Icons by a brilliant Bulgarian artist. Byzantine, Coptic and other Eastern influences are evident in the great manuscripts such as the Book of Kells. Wonderful paintings to inspire and uplift! Highly recommended site. Details of the Celtic music festival Celtic Days on Lake Constance in Switzerland. Information about the Celtic harpist Kora Wuthier and her CD "Turquoise". Replica Celtic and other historic jewellery from Germany, by Markus Niedhardt. Quality site entitled "The World of Celtic Art". Based in Holland and run by enthusiastic Celtic artist Peter Oostervink. Well worth a visit. Replica ancient glass artefacts, fine reproductions, unique high quality glasswork from Germany. Beautifully produced small magazine dedicated to the European Celtic tradition. If you read Italian you’ll enjoy this one. If not, the artefact pictures alone are well worth it. The Bard of Avalon - An evocation of the Celtic Otherworld. Beautiful Celtic artwork by Vitor Gonzalez of Asturia (the Celtic region of Spain). Original designs by a dedicated and enthusiastic artist. Recommended. Danish magazine devoted to prehistoric and medieval archaeology, history, and related subjects. Web site has English text option. Publication in Danish, distributed worldwide. Old and hard-to-find Irish books. Oliver Curran, artist of the Irish famine. Traditional Hand tooled Celtic art repoussed on solid copper. Celtic crafts by Jen Delyth, drawn from Celtic mythology and the mysteries. Designs inspired by the spirit at the heart of the ancient tradition. Silk scarves, cotton throws, fine art prints, silver jewellery, hand-printed T-shirts, recycled paper stationery and more. The beautiful and intricate artwork of Michael Carroll. Exquisite detail, and authentic materials used. A site for enthusiasts of quality Celtic art. Recommended. The site of unique contemporary Celtic artwork by Steve O’Loughlin. Includes picture-gallery of paintings, links to other artists etc. The Celtic artwork of Irish-American artist Lisa Laughy. Examples of quality paintings by an experienced and dedicated Celtic artist. Quality gold Celtic jewellery in traditional styles, made by dedicated Celts in California. Ancient artefacts with their history. THE CELTIC CONNECTION. Widely distributed full newspaper-format Celtic magazine produced in Vancouver, Canada, dedicated to 'Celts Everywhere' and with a large following in Canada and USA. Bi-monthly publication, sent worldwide. Contemporary news, books, music, sport, culture and more. Of much interest to Celtic enthusiasts anywhere on the planet. Longstanding and dedicated Celtic re-enactment organisation based in California, with newsletter 'An Tarbh', and information/events about the Celtic scene in America. Delightful and friendly folk! Fine metalwork sculpture by M.C. Foley, USA. Quality works incorporating Celtic and Classical artwork. 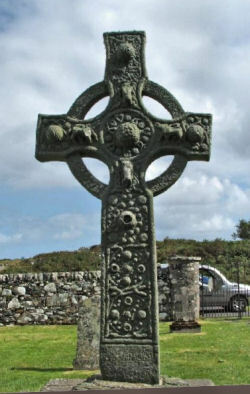 Section on Celtic crosses. as well as other items with elaborate Celtic designs. Traditional and contemporary music from Maine, available on CD’s and cassettes, focussed around the Celtic harpist Julia Lane. 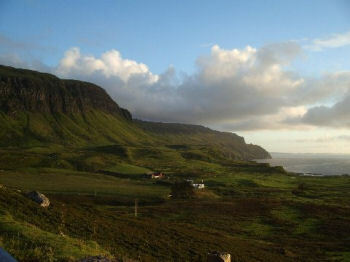 Recommended recordings by musicians who often visit the Celtic Countries for inspiration. Various ancient spiritual traditions represented on this many-faceted site, including a new all-Celtic section with worldwide contacts. Excellent and inspiring novels by Irish-American author Nancy Monaghan, including The Druid Stone. Various titles presenting Celtic mysteries for young adults, set in authentic locations of Ireland, Wales etc. Well-recommended reading. Cocopah has its own line of sterling Celtic components and bead kits plus Celtic beads from Wales and Ireland. Celtic initials and other items for sale. Celtic artwork, designs and prints in attractive watercolours by Bernadette McBride. Site has on-line purchase facilities. Quality pewterwork from New Brunswick, Canada. Celtic designed products a speciality. Spirit Tree Creations - Fine Celtic woodcarving from Arizona, quality one-of-a-kind craftsmanship. The King Who Cast No Shadow - poem by historian Burr C. Brundage about King Arthur. Original Celtic designs hand-drawn by Australian artist Bernard Casimir are now available as prints. Comprehensive site on Russian megaliths, dolmens and prehistoric sites. Maps and photographs, English text option. Well recommended, fascinating and informative site. Celtic mythology and sacred icons - the art of Rita Stynes Strow. Well recommended site for inspirational paintings to be enjoyed worldwide. Regularly updated list of web sites of Celtic artists worldwide, combined with an on-line Celtic art discussion group. Site dedicated to the seafaring Celtic Saints Brendan, Aidan, Columba, Columbanus, Patrick and others. Much useful information and a handy site map. Free weekly ezine of free Celtic Music MP3 Downloads. Celtic music-lovers check this one out! Castlebooks offers articles and interviews on Mythology of Joseph Campbell and the Hero. Links to various sites of Celtic art and related interes. Music, the arts, TV, video, interesting site of activities worldwide � well worth checking out!